As a Minnesota resident who happens to like duck hunting a lot, I’m always looking at water. How cold it gets in November can mean the difference between being able to hunt some of my spots until the season ends or having to give it up before the closing bell rings. Naturally, by this time of year - unless the water is moving pretty good - it’s all frozen solid. The season is a distant memory, and we’re months from being able to safely do any water-based drills with our dogs. This means a lot of us take this time to let our retrievers get a little slow and pack on a few pounds of winter weight. 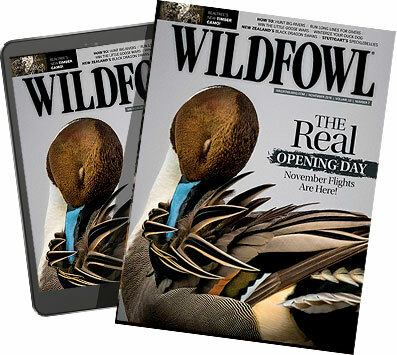 After all, it’s still nine months until early teal or goose will be open, so what’s a little slacking off going to hurt? With some dogs, probably not much provided they get plenty of training throughout the summer. For the rest, taking a couple of months off isn’t the best idea and the progress made throughout the season will start to backslide. This is no good but does beg the question on what kind of drills you should be conducting during the frozen months of the off-season. To answer this question, consider your duck dog goals first. A dog’s ability to stay steady, problem solve, and continually learn can all be helped or hindered by what we ask them to do on a daily basis. In other words, the more challenging drills that they will accomplish and gain confidence through, the better. In the off-season, this obviously won’t be through water retrieves for many of us. That’s okay – a dog that has to think through a problem on land is going to benefit as well. Even though water work is probably out of the question right now, there are still plenty of training opportunities outside that will allow a duck dog to stay sharp in the off-season. What I do for my Lab all winter long is when we’re shed hunting or just out for a general stroll, I’ll lead us to a frozen body of water that is ringed by cattails. 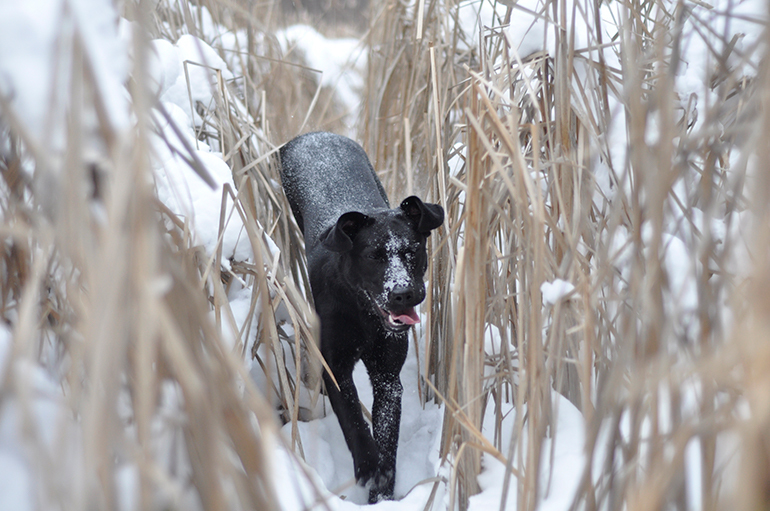 Winter cattails are thick, gnarly, and ideal for blind retrieves. They also allow me to direct my dog via hand signals and for her to work the wind in a place where she definitely won’t see the dummy until her nose is practically touching it. While she won’t be swimming (hopefully), she’ll be in the ballpark of a common duck hunting scenario. If you don’t have cattails, don’t fret. It’s not terribly hard to find thick cover in which to work a dog. Just remember to pick a location that offers the right challenge for your dog’s abilities. You don’t want to make it so difficult that the dog can’t do what you ask it to do. And also remember that if you’re conducting dummy-based drills in the snow, it doesn’t take more than a few inches of powder for the bumper to totally disappear. This is a bad deal because the dog won’t be able to scent the dummy if it’s buried in the fresh snow, so pay attention to your training environment. If the conditions are right and you’ve got a dog that is ready, the right winter cover will be perfect for doubles and even triples. If setting up elaborate blind retrieves when it’s seven degrees outside isn’t your thing, at least work on steadiness. Work on steadiness all winter long with your dog. There is nothing that rounds out a rock star retriever like being truly steady. This can happen in the living room, or out in the field, but there are dozens of opportunities each week to ask a dog to wait for your release command. At the very least, do this. You won’t regret it come September. 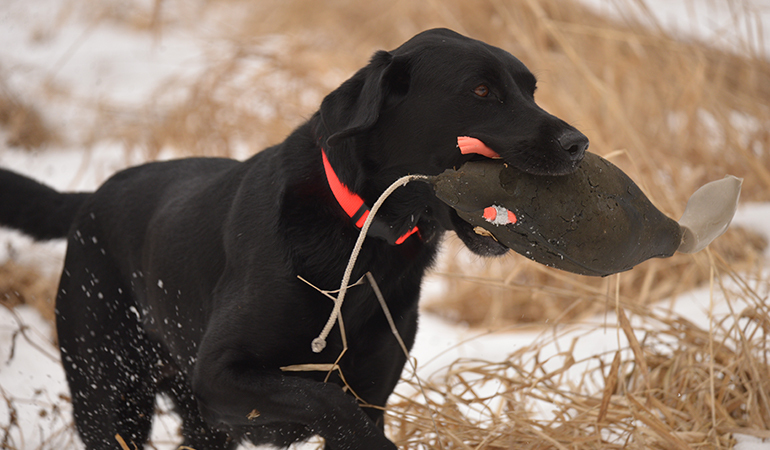 I’m of the humble opinion that waterfowl retrievers should be kept in good shape all year long. This has so many obvious benefits for dogs and our hunting success that I shouldn’t have to explain myself, so I won’t. I’ll just say that a healthy, physically fit dog is a blessing in the blind or in the boat, and also the kind of dog that will work for you through as many seasons as absolutely possible. A lot of duck hunters let their retrievers go abit soft in the winter months both physically and mentally, but that’s a badidea. 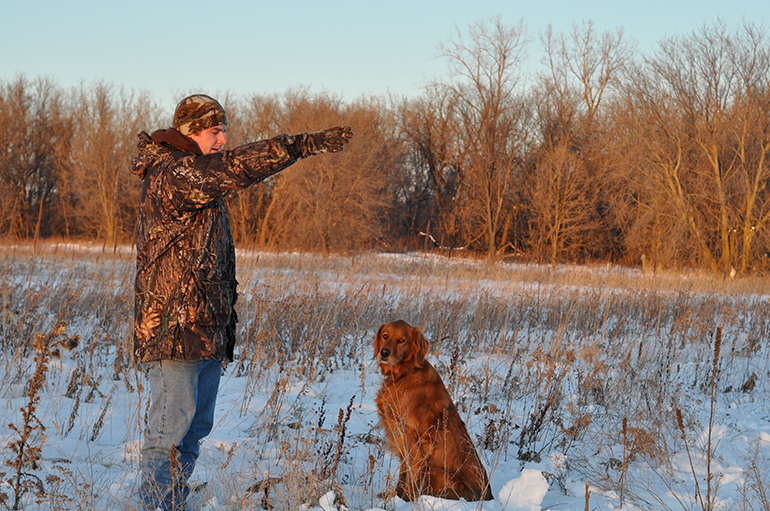 Keep working drills with your dog throughout the off-season to keep themhunt-ready. Pounding away throughout the winter months is a good thing, but stay cognizant of the surfaces upon which you ask your dog to work. Ice is no good, and a frozen soccer field might be just as hard on joints as an asphalt parking lot. Pay attention to where your dog is working and make sure you’re providing the right opportunities to stay in shape without causing preventable damage to joints or paws. For most of us, this is the worst time of the year. The next hunting season is so far away it doesn’t seem real. But when it does come, you’ll want to have a dog that is sharp, steady, and ready to rock and roll. All of that is made possible right now, so pull on your boots, grab a dummy, and get out there.